(1902–74). 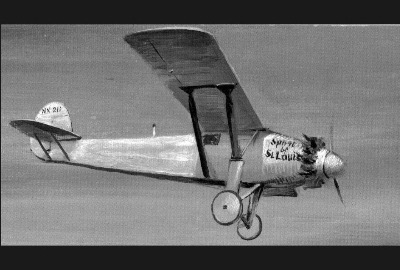 On May 20–21, 1927, Charles A. Lindbergh flew a small silvery monoplane, called the Spirit of St. Louis, nonstop from New York City to Paris. It was the first one-man flight across the Atlantic Ocean. The daring, skill, and endurance of “Lucky Lindy” won him world acclaim. After his flight Lindbergh devoted his career to aviation and science. Charles Augustus Lindbergh was born on Feb. 4, 1902, in his grandfather's home in Detroit, Mich. His father, Charles Augustus, Sr., had been brought from Sweden to a Minnesota farm as an infant. His mother was Evangeline Lodge Land, a teacher. In 1906 Lindbergh's father was elected to the United States Congress and became widely known for his liberal debates. Young Charles divided his time between Washington, D.C., and the family's Minnesota home near Little Falls. He fished, hunted, and had a special interest in machinery. He understood every part of his bicycle and, as he grew older, of his motorcycle and car. Lindbergh graduated from Little Falls High School in 1918 and in 1920 entered the University of Wisconsin. After three semesters he left and entered an aviation school in Lincoln, Neb. There he studied the theory and mechanics of flight. He also learned to make parachute jumps and to walk on the wing of a flying biplane. He made his first solo flight at Americus, Ga., in April 1923. For a time he earned his living by barnstorming—taking passengers for short rides and performing in daring exhibitions of aviation. In March 1924 he became a flying cadet in the United States Air Service Reserve. He trained at Brooks and Kelly fields, near San Antonio, Tex. He graduated with a pursuit pilot's rating and the rank of second lieutenant. After graduation he was hired as a test pilot by a St. Louis firm. This firm won a contract to fly mail between St. Louis and Chicago. Lindbergh made his first flight over the route on April 15, 1926. Within a year, he flew more than 50,000 miles (80,000 kilometers) over this mail route. Twice he had to make parachute jumps to save his life. Seasoned by more than 1,500 hours of flying, Lindbergh decided to try for the $25,000 prize first offered by a hotel owner, Raymond B. Orteig, in 1919 for the first nonstop flight between New York City and Paris. St. Louis businessmen agreed to provide financial backing. Early in 1927 Lindbergh went to San Diego to supervise the building of a Ryan monoplane, which he named the Spirit of St. Louis. Lindbergh put his new plane through severe tests. On May 10, 1927, he flew it from San Diego to St. Louis; and on May 12, he reached New York, setting a new coast-to-coast record. He entered his name in the contest for the Orteig prize. Only a few days before, on May 8, the famous French flying aces Charles Nungesser and François Coli had perished in their attempt to fly from Paris to New York. When news spread that Lindbergh would try to fly the Atlantic alone, people shuddered. Few knew how carefully he had prepared. Early in the morning of May 20 Lindbergh climbed into the Spirit of St. Louis at Roosevelt Field on Long Island. Down the runway the plane lurched and bounded. Heavily loaded with gasoline, it clung to the Earth, bounced, dropped, and then lifted slowly. At 7:52 AM the plane took off, vanishing in a drizzle. Just before nightfall, Lindbergh passed over St. John's, Newf., on the way to the open sea. Through fog, rain, and sleet, the plane throbbed on, true to the course. At 10:00 PM, Paris time, May 21, a crowd at Le Bourget Field heard the faint drone of a motor. Louder and louder it grew until the search-lights played upon a silver bird. At 10:21 PM it alighted, having flown 3,600 miles (5,800 kilometers) in 33 hours and 30 minutes. From the cabin of the plane, Lindbergh emerged a world hero. At 25 he had performed a feat greater than any other in the history of aviation. He was decorated by the president of France, the king of Belgium, and the king of England. President Calvin Coolidge presented him with the Distinguished Flying Cross and made him a colonel in the Air Corps Reserve. Medals and gifts poured in for him from all parts of the world. Lindbergh then devoted himself to inspiring confidence in the airplane as a practical means of transportation. He refused commercial offers that would have made a fortune for him. Sponsored by the Daniel Guggenheim Foundation for the Promotion of Aeronautics, he flew the Spirit of St. Louis to cities in every state of the Union. He made a goodwill swing over Mexico, Central America, the West Indies, and Cuba that ended on Feb. 13, 1928. Then he gave his plane to the Smithsonian Institution. He was made air counsel to the Department of Commerce and adviser to commercial aviation companies. In 1929 he married Anne Morrow, daughter of Dwight W. Morrow, then ambassador to Mexico. She was his copilot and navigator on later expeditions. In 1931 they blazed a northern air route from New York to China, and in 1933 they circled the North Atlantic coast to study air lanes and bases for commercial transatlantic flying. In 1937 they surveyed an air route from England to India. Lindbergh also made contributions to archaeology and medical research. In 1929, flying over the Yucatán peninsula, he photographed Mayan ruins. With Dr. Alexis Carrel of the Rockefeller Institute for Medical Research, he developed a method for separating red corpuscles from blood serum. With Carrel in 1935 he perfected an “artificial heart and lungs” that kept parts of the body alive with a supply of blood and air. Along with fame, bitter tragedy came to the Lindberghs. Their first child, Charles, who was born in 1930, was kidnapped and killed in 1932. In 1935 the Lindberghs established themselves in Europe. Returning to the United States in 1939, Lindbergh publicly opposed U.S. intervention in World War II, resigning his commission in the Air Corps Reserve in 1941. When the United States entered the war, however, Lindbergh served as a civilian employee in the Pacific war zone. He had flown 50 combat missions by the war's end. In 1954 he was named a brigadier general in the Air Force Reserve for his longtime service to government agencies. In the 1960s Lindbergh became involved in conservation, working to save the humpback and blue whales from extinction. Lindbergh won a 1954 Pulitzer prize for his autobiographical The Spirit of St. Louis, and The Wartime Journals of Charles A. Lindbergh was published in 1970. He died in Hawaii on Aug. 26, 1974. 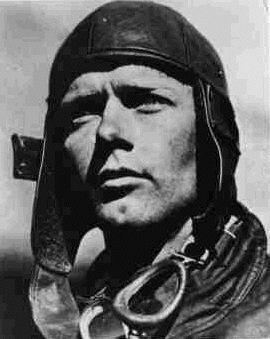 Charles Augustus Lindbergh, (Detroit, Míchigan, 4 de febrero de 1902 – Maui, 26 de agosto de 1974), aviador e ingeniero estadounidense. Fue el primer piloto en cruzar el océano Atlántico en un vuelo sin escalas en solitario, aunque no el primero en cruzar el Atlántico sin escalas. El vuelo enlazó Nueva York y París, a más de 5.800 km de distancia, ganando con ello el premio Orteig, de 25.000 dólares de la época. Lindbergh nació en Detroit (Míchigan), en el seno de una familia de inmigrantes suecos. Su padre ejerció la política y más tarde fue congresista, tribuna desde la que mostró su oposición a la entrada de los Estados Unidos en la Primera Guerra Mundial; su madre era profesora de química. Muy pronto el joven Charles comenzó a mostrar interés por las máquinas. En 1922 abandonó sus estudios de ingeniería mecánica, se unió al programa de entrenamiento de la escuela de vuelo y mecánica de la Nebraska Aircraft Corporation en Lincoln (Nebraska) donde realizo su primer vuelo el 1 de abril de 1922 como pasajero en un biplano Lincoln-Standard “Tourabout” pilotado por Otto Timm. y posteriormente compró su propio avión, un Curtiss JN-4 Jenny. En 1924 comenzó a entrenar en el cuerpo aéreo del ejército de los Estados Unidos. Tras finalizar primero de su promoción, trabajó como piloto civil en la línea de correo de San Luis en los años 20. Decidió optar a un premio de 25.000 dólares ofrecido en 1919 por el filántropo francés nacionalizado americano Raymond B. Orteig para el primer piloto que realizara un vuelo trasatlántico sin escalas entre Nueva York y París. En su monoplano de un solo motor Ryan NYP (un Ryan M-2 modificado), bautizado como Spirit of St. Louis, Lindbergh despegó del aeródromo Roosevelt (Long Island) el 20 de mayo de 1927 y tras un vuelo de 33 horas y 32 minutos, aterrizó en el aeropuerto de Le Bourget, cercano a París. Posteriormente se convirtió en asesor de aerolíneas comerciales. Charles Lindbergh pilotó también el primer vuelo oficial de la línea aérea Mexicana de Aviación. En 1932, el secuestro y posterior asesinato de su hijo de 19 meses atrajeron el interés nacional e internacional. Un carpintero de origen alemán llamado Bruno Hauptmann fue declarado culpable y condenado a muerte. Aunque la evidencia encontrada en el momento inculpaba a Hauptmann, han existido dudas respecto a su culpabilidad basadas tanto en errores de procedimiento durante el juicio, como en evidencias no incluidas durante el mismo. La familia Lindbergh se trasladó a Europa en 1935 y Lindbergh pudo estudiar la organización y funcionamiento de las fuerzas aéreas de varios países. A su regreso a Estados Unidos (1939) recorrió el país dando conferencias en contra de la guerra, y declarándose partidario del aislacionismo estadounidense. Se declaró de forma abierta partidario de Adolf Hitler y partidario de los partos selectivos, por lo que fue obligado a dimitir de sus cargos (la novela de Philip Roth, La conjura contra América, narra un situación en la que un antisemita y prohitleriano Charles Lindbergh accede a la presidencia estadounidense tras vencer en las elecciones de 1940 a Franklin D. Roosevelt). No obstante, durante la Segunda Guerra Mundial actuó como técnico civil de las compañías fabricantes de aviones, y llevó a cabo misiones en el océano Pacífico y en Europa al servicio de las fuerzas aéreas estadounidenses, con lo que logró recuperar algo de su imagen pública.